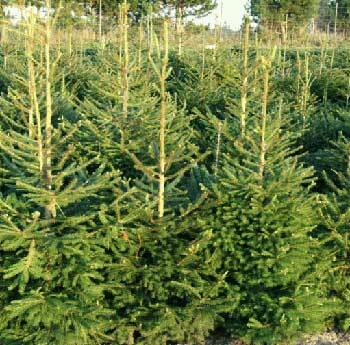 Norway spruce is an evergreen tree; the stem, covered with scaly, red-brown bark, grows to 130 feet. The winter buds are reddish or light brown and produce young shoots at the tips of the branches in May. The dark green, quadrangular needles grow spiral around the branchlets. The catkin-like flowers bloom in May, the male yellow or red, and the female bright purple. The light brown cones are cylindrical-oblong in shape and 4-7 inches long. Found in central and northern Europe; many varieties are cultivated. Before the days of sweet flavored chewing gum, country boys gathered their gum from the spruce trees. City kids could buy this old-fashioned gum in drugstores, at candy counters, and general stores at a penny a lump. Spruce gum is tangy, purple hued and long lasting. When the tree is tapped, the pitch makes an excellent turpentine with powerful healing properties. The leaves and branches are used in making spruce beer and in nonalcoholic beer. The gum is used in incense, perfume, medicinal salves, adhesives, etc. A tea using young shoots, taken warm, promotes perspiration, reducing fevers. Helpful for coughs, catarrh, and influenza. For bronchitis try a vapor bath of young shoots. Either the shoots or needles can make calming additive to baths. The Burgundy pitch from this tree was once used as a base for medicinal plasters. Treats gonorrhea, leukorrhea, bladder infections, scurvy, and for cleansing the system. Externally, good for wounds, ulcers and sores. Infusion: steep 1 or 2 tsp. shoots in 1 cup hot water for 5 or 10 minutes. Sweeten with honey or raw sugar if desired. Decoction: add 2-4 oz. shoots to 1 quart cold water and let stand for several hours. Bring to a boil and boil briefly, then let stand for 15 minutes. Take 1/2 cup a day, sweetened if desired. Bath Additive: add 7 oz. spruce needle extract to a full bath. When fresh shoots are available, a strong decoction made from 1 to 5 lb. shoots can be used in place of the extract.